Let we see that the Confidence in motion with new 2013 Subaru Forester. The Forester could be credited as the original formulator of the car-based crossover SUV. The United States Auto Club compare its All-wheel Drive System with the Ford Escape, Honda CR-V Real time 4WD, Toyota RAV4, and Nissan Rogue Intuitive AWD and forester won the match . Watch this video clip below. To recap, there are two Forester models: the 2.5i , which gets a carry-over, 170-hp 2.5-liter flat-four, and the 2.0XT, which gets a new 250-hp turbocharged flat-four based on the BRZ’s naturally aspirated 2.0-liter engine. The 2.5i comes in base, Premium, Limited, and Touring versions; the 2.0XT comes only in Premium or Touring guise. A six-speed manual is restricted to the 2.5i and 2.5i Premium and replaces a five-cog unit; all other Foresters get a CVT in place of the outgoing car’s four-speed automatic. We were set loose on paved and unpaved back roads in rural Arizona in a Forester 2.5i Premium manual, a 2.5i Touring, and a 2.0XT Premium. the 2.5i’s all-new unit isn’t bad, and the way it oozes the Forester down the road while keeping engine revs low seems like a win for the average crossover shopper. The 2.0XT’s turbo four is quick, and while no manual transmission is offered, the model at least offers three drive modes. Intelligent mode utilizes normal throttle and transmission responses for daily driving. Sport mode enlivens throttle response and offers six driver-selectable forward gear ratios when he uses the lever or steering-wheel paddles to actuate shifts. Sport Sharp further enlivens engine response and switches the CVT to a pseudo-eight-speed automatic; the eight fake gears are also selectable via lever or paddles. SUBARU BOXER Engine. Flat. Smooth. Smart. Drawn from a century of intelligent performance, the horizontal layout of the SUBARU BOXER engine combines balance with power and efficiency. And every Subaru comes with a SUBARU BOXER engine. Like the jabs of a boxer, where the engine got its name, the SUBARU BOXER layout allows the engine to be positioned in-line with the drivetrain for maximum transfer of power. Many other engines are transverse, or turned perpendicular, and can require additional drivetrain components to transfer power, reducing vehicle efficiency. The punch-counterpunch movements of the boxer's pistons cancel out each other for a smoother running engine without having to use additional components to counteract them as in many in-line and V-type engines. With pistons moving horizontally, the SUBARU BOXER engine has a flat, low profile, almost perfectly symmetrical, for a well-balanced vehicle. Its low profile can provide a lower center of gravity than other designs, helping provide quick handling response and flat, confident cornering. Symmetrical All-Wheel Drive. Control the road. You need balance and an even distribution of power for maximum traction, instead of the slip-then-grip alternative. Almost every Subaru comes standard with Symmetrical All-Wheel Drive for better stability, efficiency and a quicker response to slippery conditions. Other AWD systems need additional drivetrain components to route the same power to the wheels, often using complex designs. More components tend to reduce vehicle efficiency and could add to higher maintenance costs. In slippery conditions, that power instinctively flows to the wheels with the best traction. Subaru is the only manufacturer with IIHS Top Safety Picks for all models, three years in a row running (2010-2012). We don't shy away from crash tests, because safety is at the forefront of our design. Along with the traction that Symmetrical All-Wheel Drive gives you, Vehicle Dynamics Control (VDC), a stability control system, automatically senses steering and braking inputs to help keep the vehicle on the driver's intended path. The VDC system also includes an all-wheel all-speed traction control system. In stopping situations, the Anti-Lock Braking system (ABS) pulses braking power to help prevent wheel lockup. Electronic Brake-force Distribution (EBD) optimizes the distribution of braking force between the front and rear wheels according to how the vehicle is loaded with passengers and cargo. And the Brake Assist system helps ensure maximum pressure is applied to the brakes as quickly as possible in an emergency situation. A ring-shaped reinforcement frame helps provide high-impact protection for the passenger compartment. An advanced airbag system deploys up to six airbags, with Forester, Outback and Tribeca models also including a rollover sensor. And the engine's low placement is designed to allow it to drive under the chassis in a front-end collision, further protecting the passenger area. Subaru takes a look into the future with EyeSight.Two cameras are mounted by the rearview mirror to monitor traffic and react to conditions even before you do. Basically, EyeSight sees the problem and initiates action to help avoid the trouble. EyeSight will also sound an alert and flash a visual warning if there's danger of a collision and will apply the brakes automatically if you don't. It can also optimize cruise control and warn drivers when they're swaying outside their lane. Forester's spacious interior offers many comfort-minded available features including a 10-way power driver's seat, reclining rear seats, and an oversized panoramic moonroof. Flexible space and features to help you tackle whatever your day holds. The 60/40-split flat-folding rear seat gives you the option to have more cargo room, while a large rear gate makes loading and unloading a breeze. 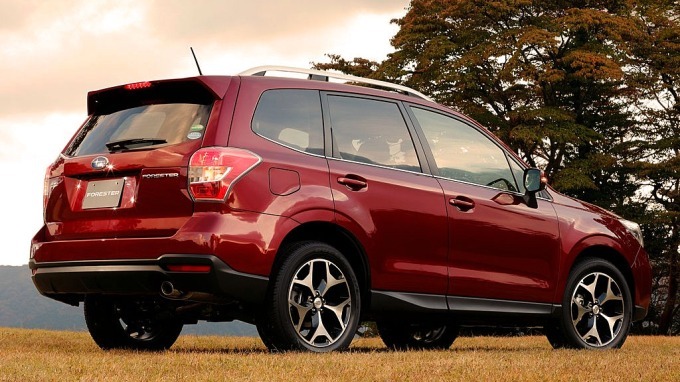 Every Forester features a total of six front, front seat-side and side-curtain airbags. The advanced system uses an array of sensors, including a rollover sensor, to help deploy the airbags in the most effective way possible. Price: The price range of Forester starting from $21,295 to $29,995. It is good to know what type of wheel will best suit my needs. There are some distinct advantages in choosing the best brands for a car. The Subaru is a high performance car with the best accessories.